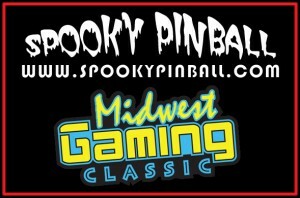 Check out our quick interview featured in the Spooky Pinball Podcast, live from Midwest Gaming Classic! Charlie Emery of Spooky Pinball stopped by our event space Friday night during his tour of the MGC for the “Golden” Episode of the Spooky Pinball Podcast. As part of Spooky Pinball’s Audio Tour chronicling the Midwest Gaming Classic’s Events with live analysis and Exhibitor and Show Attendee interviews, Charlie made a visit to our event space on Friday night to see what we were about and what had to offer. Thanks to Six Degress of Kevin Bacon Ben Heckendorn, who designed Spooky Pinball’s first mass produced custom pinball machine America’s Most Haunted (now shipping by the time of this post, with Spooky’s own Pinball Zombies From Beyond the Grave not too far behind), Charlie was familiar with the modding scene and during our brief chat we talked about how portablizing has evolved over the years, Ben’s past and present projects in his prior existence of Console Modding, our event displays, and tales of MGCs past. Despite both our work in differentiating genres, what we do here at PoD is not unlike that of Spooky Pinball, and we do have some overlap in our Venn Diagram of modding friends such the the aforementioned Ben and Longhorn Engineer’s Parker Dillman, who helped design and create the Pinheck system which will be used in Americas Most Haunted and Spooky Pinball’s own Pinball Zombies From Beyond the Grave, to name a few. 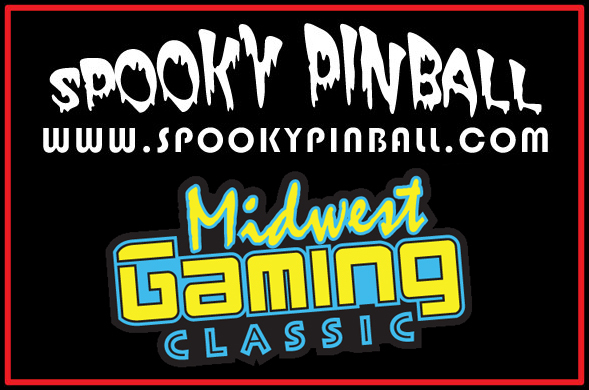 Our interview is around the 42:00 minute mark, but be sure to check out the rest of the Episode for more Midwest Gaming Classic and Pinball-centric coverage by Charlie and the Spooky Pinball crew.